Neanderthals were hunter-gatherers who inhabited western Eurasia for more than 200 thousand years during glacial as well as interglacial periods until they became extinct around 40 thousand years ago. While some of the anatomical regions of these extinct humans are well known, others, such as the vertebral column and the ribs, are less well known because these elements are more fragile and not well preserved in the fossil record. In 1983 a partial Neanderthal skeleton (known officially as Kebara 2, and nicknamed "Moshe") belonging to a young male Neanderthal individual who died some 60,000 years ago was found in the Kebara site (Mount Carmel, Israel). While this skeleton does not preserve the cranium because some time after burial the cranium was removed, probably as a consequence of a funerary ritual. However, all the vertebrae and ribs are preserved, and so are other fragile anatomical regions, such as the pelvis or the hyoid bone (a bone in the neck to which some of the tongue muscles are attached). So it is the skeleton that preserves the most complete thorax in the fossil record. New statistical and virtual reconstruction methods have enabled the researchers to extract new information, which has just been published in the prestigious journal Nature Communications. For over 150 years, Neanderthal remains have been found at many sites in Europe and Western Asia (including the Middle East), and the thorax morphology of this human species has been a subject of debate since 1856, when the first ribs belonging to this human group were found. Over the past decade, virtual reconstructions have become a new tool that is increasingly being used in fossil study. This methodology is particularly useful with fragile fossils, such as the vertebra and ribs that form the thorax. Nearly two years ago, the same research team created a reconstruction of the spine of this Neanderthal individual; it displays the preserved spine of Kebara 2 showing less pronounced curves in these humans when compared with Homo sapiens. The team's paper, published in the book Human Paleontology and Prehistory, pointed to a straighter spine than that of modern humans. For this virtual model of the thorax, researchers used both direct observations of the Kebara 2 skeleton, currently housed at Tel Aviv University, and medical CT (computerized axial tomography) scans of the vertebrae, ribs and pelvic bones. Once all the anatomical elements had been assembled, the virtual reconstruction was done by means of 3D software specifically designed for this purpose. "This was meticulous work," said Alon Barash of Bar Ilan University in Israel. 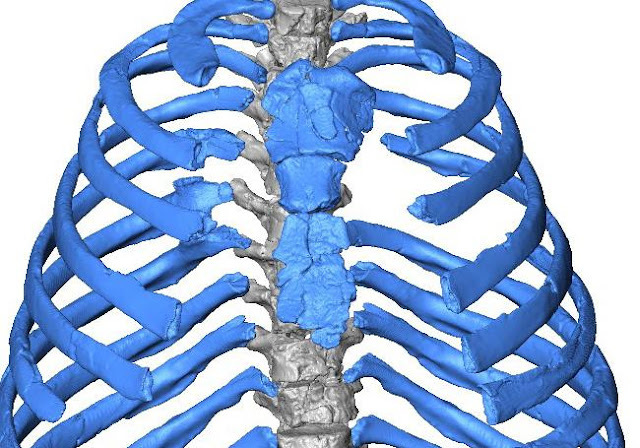 "We had to scan each vertebra and all of the rib fragments individually and then reassemble them in virtual 3D." "In the reconstruction process, it was necessary to virtually 'cut' and realign some of the parts that displayed deformation, and mirror-image the ribs that had been best preserved in order to substitute the poorly preserved ones on the other side," said Asier Gómez-Olivencia, an Ikerbasque research fellow at the University of the Basque Country. "The differences between the thorax of a Neanderthal and of a modern human are striking," said Daniel García-Martínez and Markus Bastir, researchers at the National Museum of Natural Sciences (MNCN-CSIC) and co-authors of the work. "The Neanderthal spine is located more inside the thorax with respect to the ribs, which provides more stability. The thorax is also wider in its lower part," added Mikel Arlegi (UPV/EHU). "The wider lower thorax of Neanderthals and the more horizontal orientation of the ribs, as shown in its reconstruction, suggest that Neanderthals relied more on the diaphragm for breathing," said Ella Been of the Ono Academic College. "Modern humans rely on both the diaphragm and on the expansion of the rib cage. Here we can see how new technologies and methodologies in the study of fossil remains are providing new information to understand extinct species." This new information is consistent with the recent works on the larger lung capacity of Neanderthals published by two of the co-authors of this study, Markus Bastir and Daniel García-Martínez (Virtual Anthropology Laboratory of the MNCN), in which they support the presence of greater lung capacity in the Neanderthals.). 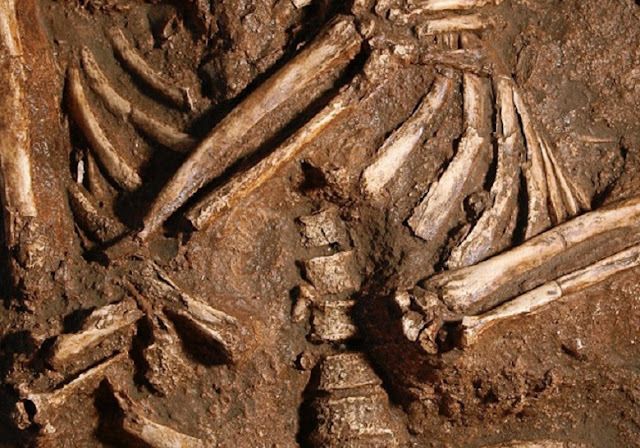 Patricia Kramer of the University of Washington sums it all up thus: "This is the culmination of 15 years of research into the Neanderthal thorax; we hope that future genetic analyses will provide additional clues about the respiratory physiology of the Neanderthals". Thanks a lot for this. Yes, that neandertal upper and lower airway anatomy and breathing physiology were considerably different from those of Homo sapiens was already proposed in the 1980s and 1990s (Verhaegen 1985 Med.Hypoth. 16:17-32, 1987 Med.Hypoth. 24:293-300, 1991 Med.Hypoth. 35:108-114, 1995 Med.Hypoth. 44:409-413). For an update google e.g. "Coastal Dispersal of Pleistocene Homo 2018 biology vs anthropocentrism".